I guess I've had vintage on my mind the last few days. It's a shame I couldn't come up with this idea yesterday. Oh well. The 4 Challenges this is for are not vintage, but with these new Stampin Up stamps I got I will be able to create vintage I think. Check out the paper piecing on the fairies dress, pretty cool. Every time I do paper piecing it amazes me. If you cut it just right you can't even tell the transition. I've said I love The Paper Studio and boy have they come out with some new paper packs that are wonderful. This one is Mirabelle, as you might have guessed very vintage. O.K. enough with the vintage. Supplies: 5 1/2" square card made with Blush Blossom, Papers: Stampin Up, The Paper Studio-Mirabelle Paper Pack, Stamps: Stampin Up-A Little Bit of Magic, Elements of Style, Ink: Ranger Archival Ink-Coffee, Stampin Up-Old Olive, Copic Markers, Sakura Gelly Roll Pen-Clear Star, Fiskars shape cutting templates-Circles-1, Super Size Circles, Stampin Up-Sizzix texture plate-Flourish, Hero Arts-gemstone stickers, lace-Offray, pop dots. 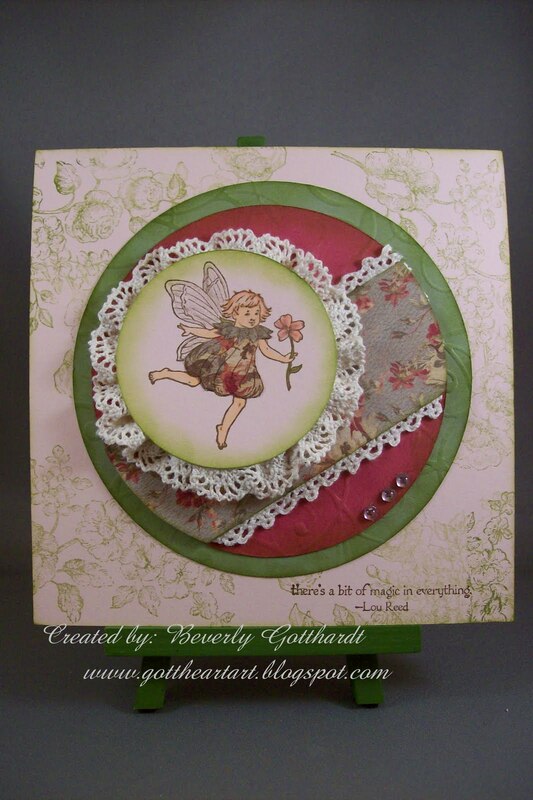 Lovely fairy card. Thanks for joining us at DDCC.